So I had promised Hubby that I would not blog about this next thing… that I’m about to blog about… I’M SORRY!! BUT IT’S SO AWESOMELY FUNNY!!!! 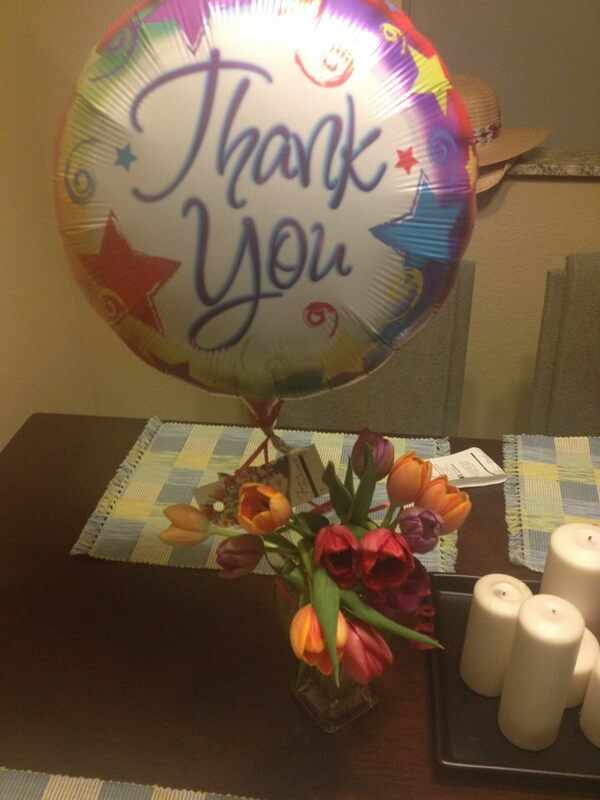 Thank you so much Hubby’s family, who sent me my favorite flowers and a wonderful note letting me know they are thinking of me during my procedure tomorrow… however… thanking me for getting skin cancer, was a little too far. Hubby: BABE! You know that was supposed to be a Thinking of You balloon!! Hubby: My aunt has a bit of an accent and they misunderstood her. Hubby: You can’t blog about this. Me: HAHAHA…. wait… what the what!?! Babe I have to!! It’s brilliant!!!! Hubby: No, you already posted it on Facebook. No. Blogging. So ya, I’m probably getting divorce papers served to me when I get home…. BUT IT WAS SO FUNNY!!!!!! This entry was posted in Humor and tagged awesome, balloon, cancer, divorce, flowers, in-laws, laugh, life, marriage, worth it, wrong. Bookmark the permalink. That’s hilarious, and probably made your day more than a Thinking of You balloon. Sorry about your upcoming divorce, though. I’ll send you a virtual Thank You balloon if it should happen. Mistake or not – somehow it’s just perfect. Hilarious – and laughter is always the very best gift. What your inlaws REALLY think of you, right? Lol.This is AWESOME. Definitely worth a divorce to post this. Yep. Definitely.